The last episode of The Bachelorette was Monday—as in, we literally just got two nights in a row of Bachelorette ridiculousness. We sat through more Chad Versus The World than we ever thought we could possibly digest in one sitting and then... we came back for more the very next day. There was one cute old-school day with James T last night (and a bunch of squirm-in-your-seat awkward ones), but let&apos;s be honest, the past three episodes have all been about Chad and how we need to see him go down in flames. 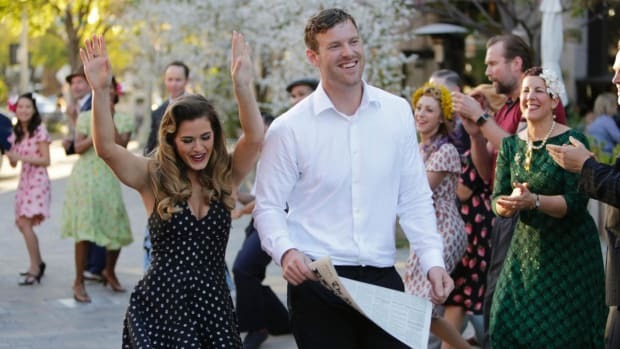 Here is what went down on the fourth episode of The Bachelorette. After the pool party, JoJo bid six men farewell—and much to everyone&apos;s discontent, Chad was not one of them. JoJo senses the bachelor pad is getting a little tense, so she tells the guys to pack their bags—they are heading to Pittsburgh. To start on a positive note, the group date at the Pittsburgh Steelers stadium with quarterback Ben Roethlisberger got the guys so excited. They were all a twitter crowded around Roethlisberger, giggling like school girls. Touch down, JoJo! Honestly though, this is how the group dates should go down. The group dates never really consist of any real interaction with The Bachelorette herself, anyway—usually they are just a Best In Show contest in which the men are compelled to demonstrate some kind of desirable quality in a mate. So yeah, why not let the guys do something they actually like? It was smart to put these guys in a situation that allowed them to have fun and exhibit some healthy physical competition. There were a few bloody noses (Evan, you should get that looked at) and even stitches, but by and large the guys had a blast swapping their Hollywood skinny jeans for some outdoor shorts. Did I mention this is the first season of The Bachelorette I have ever watched? Still, as I watched JoJo make out with at least three men this episode (not including the smattering of quicker lip locks during one-on-ones), I can&apos;t help but wonder if she has her head in the game here. I know, I know, kissing can tell you a lot about a guy, but I think there comes a point (especially when you are dating 16 men at once) where physical chemistry has been established, and you focus on things like compatibility...and friendship. Case in point: Robbie&apos;s (no date for him yet, but he did get a long make-out sesh) assessment of his window of opportunity for QT with JoJo was, "I don&apos;t know if we spent more of the time kissing or talking..." All I can say is if JoJo is looking for the man to spend the rest of her life with, I think at this point she may have swab tested these guys enough. At the end of this episode there was only one more man to be sent home—and an awkward third-wheeler date would decide the unfortunate man&apos;s fate. As if a date with your girlfriend&apos;s other lover isn&apos;t bad enough, Alex got paired with...Chad. I suppose that whomever arranged a quiet hike in the woods imagined Alex on one arm and Chad on the other—the three of them bantering and basking in nature. Instead it played out like an eerily silent death march to the one rose that would decide their fate. One awkward attempt at conversation was made before JoJo put them out of their misery and asked Alex for a one-on-one. 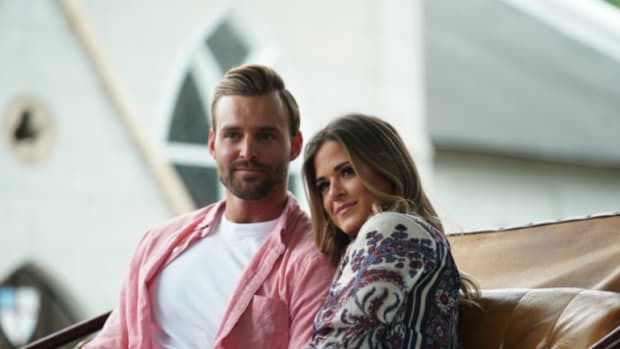 It wasn&apos;t much of a date, JoJo basically wanted to know what was up with Chad, and Alex happily tells her about Chad&apos;s threat to "find" Jordan (former footballer with the hair) after the show wraps. Chad isn&apos;t the only bear one shouldn&apos;t poke on this show. Upon hearing this unsettling news, JoJo, it seems, is about to get all mama bear on Chad. (At least we hope). Alas, JoJo ended up doing a bit of crying in the woods alone. But then she confronts Chad, and he admits that when verbal communication seems ineffective—he favors physical retaliation. Yikes! At this point in the episode it dawns on us: JoJo is alone in the woods with crazy Chad. Now the creepy date in the woods makes sense...well played. JoJo tells Chad to pack his bags, and she and Alex find a cozy cabin in the woods to snuggle and talk about Chad some more. Meanwhile...Chad is wandering around in the dark woods, whistling as he makes his way back to the guys&apos; house to settle a score. So. Creepy. 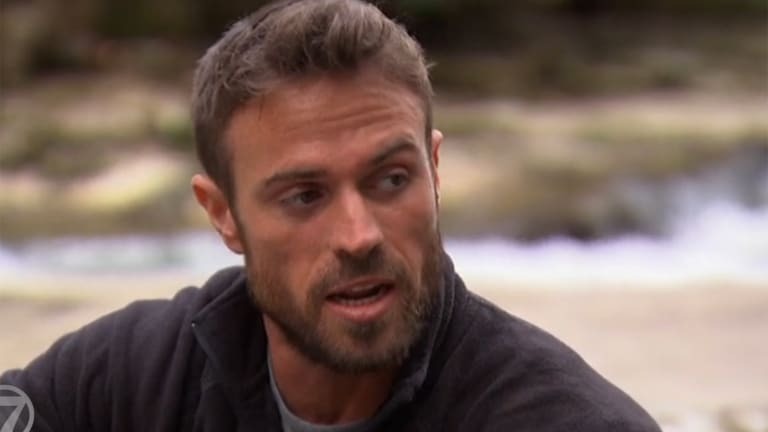 Viewers are left with the distinct perception that it&apos;s not over with Chad until he says it&apos;s over. Where&apos;s that security guard when you need him?